The script also animates the grass/vegetation growth which looks completely natural. No plugins of any kind are needed. It does not use hair or particles, it creates real geometry, so that you get total control on each blade or leaf and the results are ideal for close up shots. Several parameters have been provided to get an infinite variety. 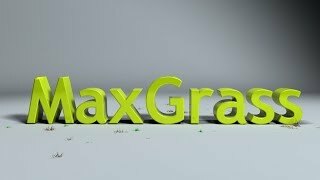 MaxGrass caters to a beginner as well as advanced users of 3ds Max. A beginner needs to click just one button to start off and an advanced user can customize many aspects of the grass/vegetation, such as use of custom models as seeds, custom grounds, distribution/height/color maps, various animation parameters, materials and much more. Static as well as growth animated grass/vegetation. Also creates and animates many other kinds of vegetation. Grass grows in bunches and has natural bending of blades. Shows live preview of the blade and a bunch as you adjust the parameters. Built in seed which is highly customizable using 11 parameters. Properties like bunching, bending of blades, quantity etc are supported using 6 parameters. Animation is customizable using 7 different parameters to control timings, bend variations etc. Custom models can be used as seed. Custom models can be used as ground. Animated seed model is supported. Distribution map, Height map and Color maps can be used to control growth and look of the grass. Face selection based and angle based distribution. 7 kinds of built in materials. Custom materials can be used. Saving and loading of user presets. Assign or change built in materials any time. Estimation of final poly count and warning for very high counts.